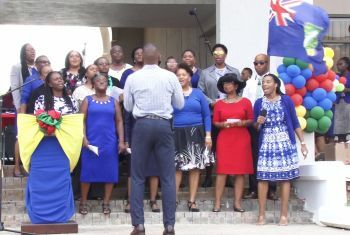 ROAD TOWN, Tortola, VI: Members of the public service received praises for their commitment to territory building which led to the recovery of the Virgin Islands after the devastating natural disasters of 2017. Those praises were uttered on Monday, October 8, 2018, at the commencement of Public Service Week 2018 under the theme “One Public Service - transforming together”. The week’s activities kicked off with praise and worship which included remarks from leaders showing public service appreciation for years of dedicated services in the various sectors. At yesterday’s kick-start event, Premier and Minister of Finance Dr The Honourable D. Orlando Smith (AL) was filled with glee reminiscing on past events that saw the participation of public servants and other legislators. 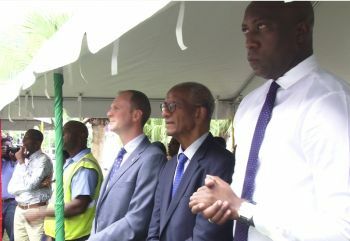 He recalled being in a track race and dropping out leaving the competition between Minister for Communications and Works Honourable Mark H. Vanterpool (R4) and Minister for Education and Culture Honourable Myron V. Walwyn (AL). Teamwork was part of his main message to those present, “With this year focus on transformation we are cognizant of the teamwork to be done in continuing moving this territory forward,” he said. He also reflected on the contribution of the public service towards the rebuilding of the territory after last year’s natural disasters. “While we were unable to celebrate public service week last year we display the same integrity, the same intensity, the same loyalty, love and team spirit and dedication to begin rebuilding almost immediately after we were impacted by Irma,” Premier Smith said. For Governor of the VI His Excellency Augustus J. U. Jaspert who is a newcomer to the celebration of Public Service Week in the territory, the celebrations will take a different focus for the first time. During previous years, the activities were designed and executed with lots of fun and competing, however, this year there will be less frolic and more recovery building activities. While the staff at the Governor’s office will try to get him dressed for the “Waky day” he notes, on another level, his firm belief is in the teamwork spirit, “I am a firm believer that the work that we do in our offices and the steps we take to make our work environment better all boils down to how brilliant we feel…” he said. “We must transform together. A team that moves together, a team collaborates, a team works together to ensure that no one in the group falls. If one falters, the team falters. We have an exciting opportunity to shape the future of the public service,” he added. Keep trying. What's the plan to get money in the treasury. Team work and your party split in half.you codda foul me big dawg. The Bible says that a divided house will fall. Agree that team work, cooperation, collaboration.......etc are vital for advancing the territory. Is the NDP a united party? Is the Smith led government a united government? Is the Premier demonstrating strong and effective leadership? If the Premier truly love the BVI, should he not act unselfish, ease the people’s pain and anguish, dissolve the HOA, set an election date and let the people vote? Is the territory heading in the right direction? Is the Premier’s participative style of leadership, hands off approach, laid back style......etc responsible for the current dysfunction? Is the UK behaving with restraint, for it fear being accused of full blown Collonialism? Or it is giving the territory more rope......? Many of you elected souls in the Virgin Islands DO NOT have it.